As we round the corner into the New Year, we’d like to take a moment to pause and reflect on what we were able to accomplish in 2018. Last year began with a major change for SEM. The many years of hard work and dedication from our team and leadership allowed us to make the move to our new location on Triangle Drive in Raleigh. As proud owners of our new office dwelling, we look forward to more change in 2019 to better align our space with our mission to change the way people make and use energy, ourselves included. Being able to grow into a larger space also allowed us to grow our team and our services. In 2018 we added 11 new team members to the SEM family, and successfully launched a new line of business — sustainability consulting. We also piloted SEM Youniversity for internal team personal and professional education. The year ended in success, with all of our departments beating their 2018 sales goals. We couldn’t say we didn’t see it coming though, since our teams were committed to reporting monthly financials and forecasting their next 90 days of financial performance every month. 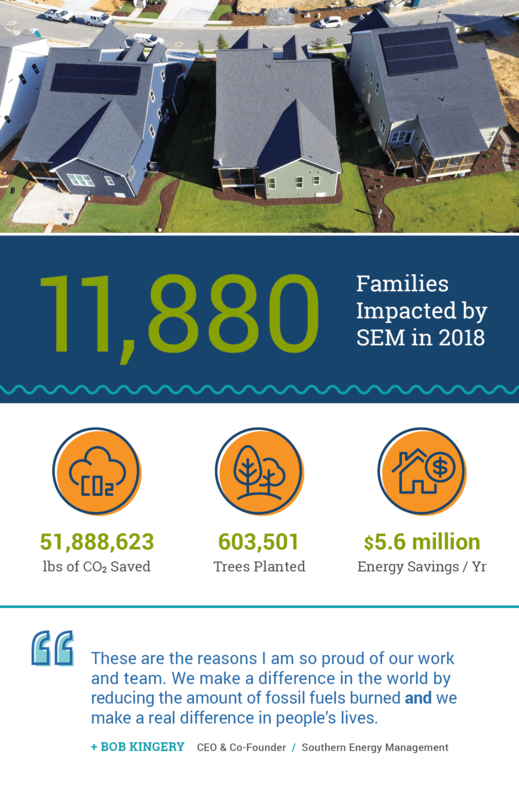 As a result, our services were able to flourish and SEM proudly touched and impacted 11,880 families in 2018 alone. This translates to an equivalent of 110 million of miles of driving offset by the services our team performed! That’s more than the distance from Earth to the sun. Our team’s achievements were met with acknowledgement and SEM was named a B Corp Best for the Environment honoree for the second year in a row. 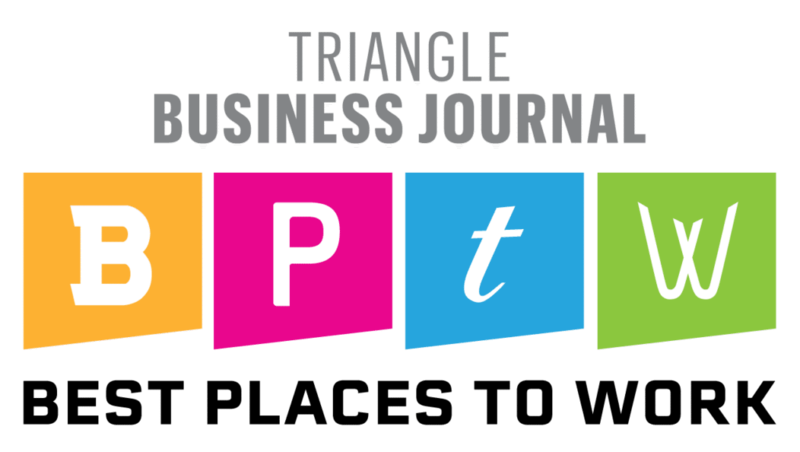 Among other honors, SEM was also awarded as a Best Place to Work in the Triangle by Triangle Business Journal. This achievement was huge for us as one of our 3 year goals we had set and met! 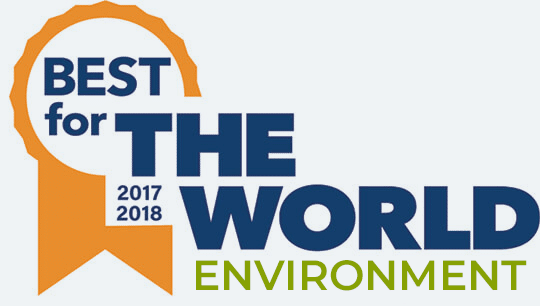 As we look into the new year, we are continually striving to improve and be better for our community, the planet, and ourselves so we can keep being named the best. 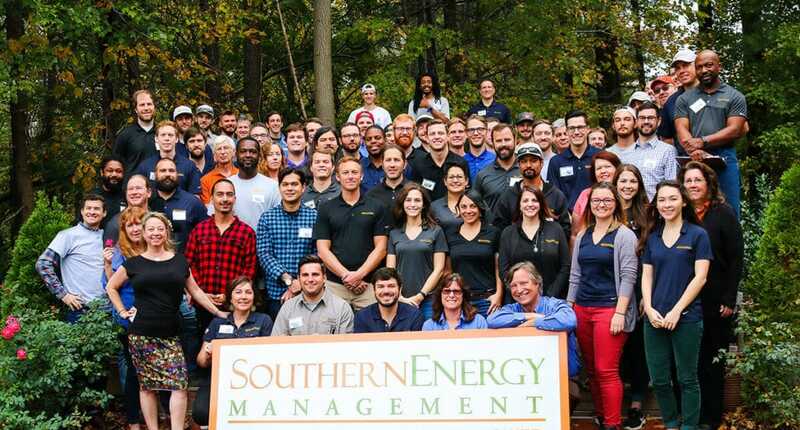 2018 proved to be another record breaking year for Southern Energy Management’s Builder Services team. We were fortunate to work with ~200 builders and provide over 13,000 inspections across the Carolinas. The Builder Services team was able to capture over $3 million in 2018 utility incentives for our partners bringing our total incentives processed to date to $11.5 million! Our team also expanded significantly with the addition of 5 new team members, making the relocation of our headquarters well worthwhile to better accommodate our growing team. We look forward to carrying the momentum into 2019 and have a long list of exciting goals centered around our mission to improve the way people make and use energy. The Builder Services team is working hard to refine processes so that we can continue to provide more value in the field via our marketing support packages. Our Zero Energy Blueprint program continues to flourish and we look forward to helping make solar a more widely offered option in the new construction market. Similarly, our Community Sustainability Services continues to offer opportunity for us to broaden our impact to the community and municipality levels! 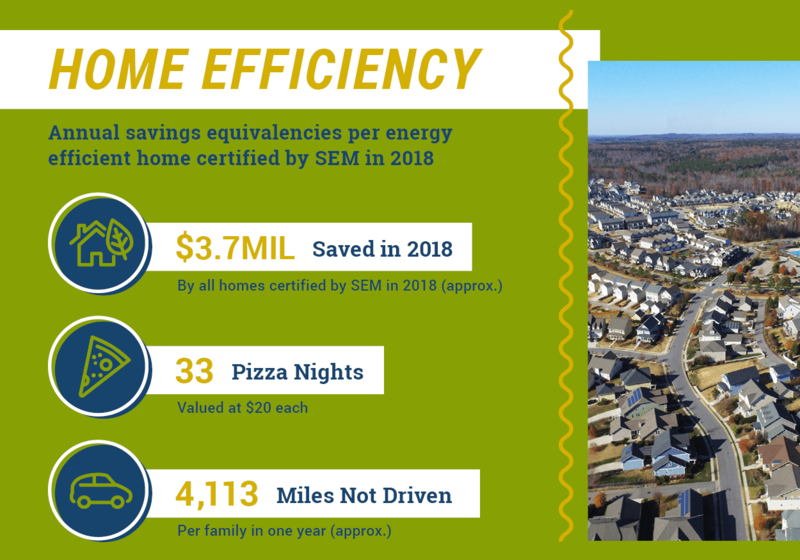 Now, more than ever, SEM has the team and processes in place to serve as your one stop shop for energy efficiency programs and residential solar! 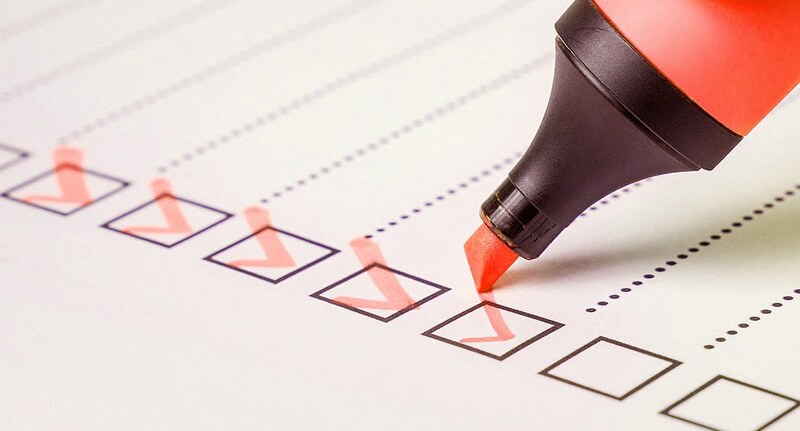 We’re excited to help you achieve your efficiency goals in 2019. Our solar division had an exciting year in 2018 with new growth in personnel, technology, and volume of projects. While we predicted some growth, we were pleasantly surprised by all the opportunities presented to us by the freshly cultivated climate for solar in North Carolina. With the newly launched Duke Solar Rebate in place, purchasing solar and generating clean energy became more accessible to families in NC. By the end of the year, we contracted with 250 homeowners to have solar energy installed! This is 2.5x what was contracted to install in 2017. 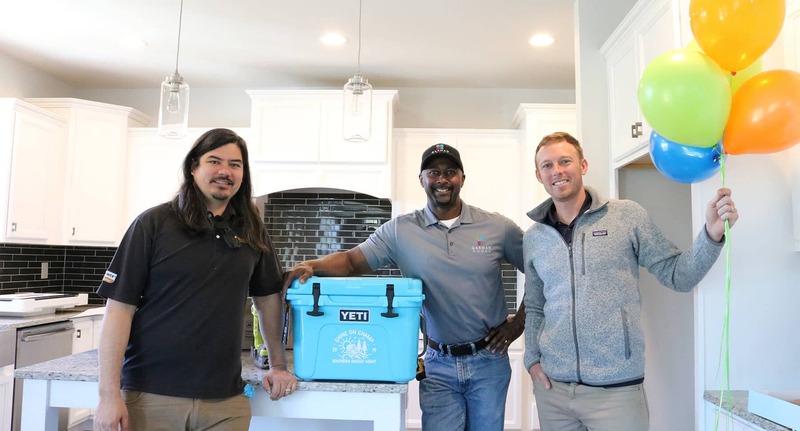 Our sales, marketing, and operations teams worked really hard (and the results have paid off) to ensure that all of our clients were in the best position possible to apply for, and receive, the Duke Energy Solar Rebate at the start of 2019. 96% of SEM solar clients who applied for the rebate received it, making solar an even better investment! 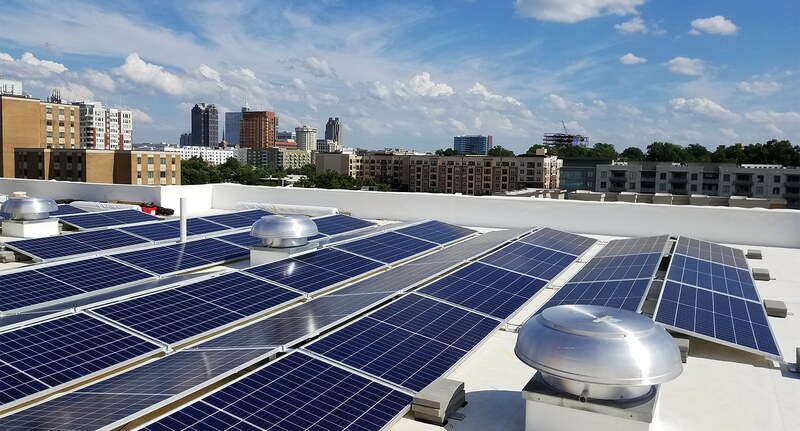 The upsurge in solar demand provided us with the opportunity to allow our sales, support, and install teams to add capacity, and we are proud to be supporting our local economy and community in this way! Last year, we also began our partnership with Tesla to install their home energy storage product, the Tesla PowerWall, as one of a handful of certified installers in North Carolina. 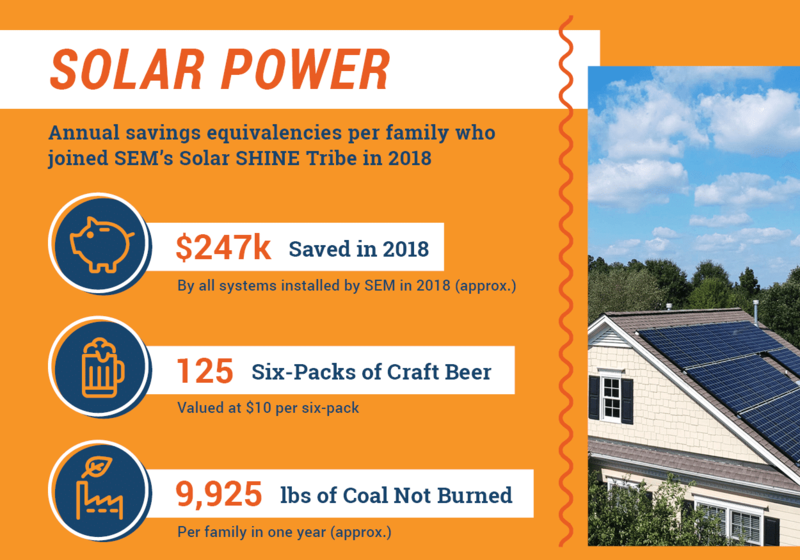 This continues to be an amazing opportunity for SEM to allow our homeowners to take the next step in the journey toward a more energy independent and self sustaining future. As we move into 2019, we are looking forward to empowering even more homeowners and businesses to make and use their own energy — while enjoying all the sunshine to come! 2018 was about growth for our Multifamily Services team. We are excited to share that we hired 2 new team members, expanding regionally by adding additional support in the western part of the state. We also broadened our service territory with new projects in 3 additional states, bringing our total multifamily services reach to 12 states. 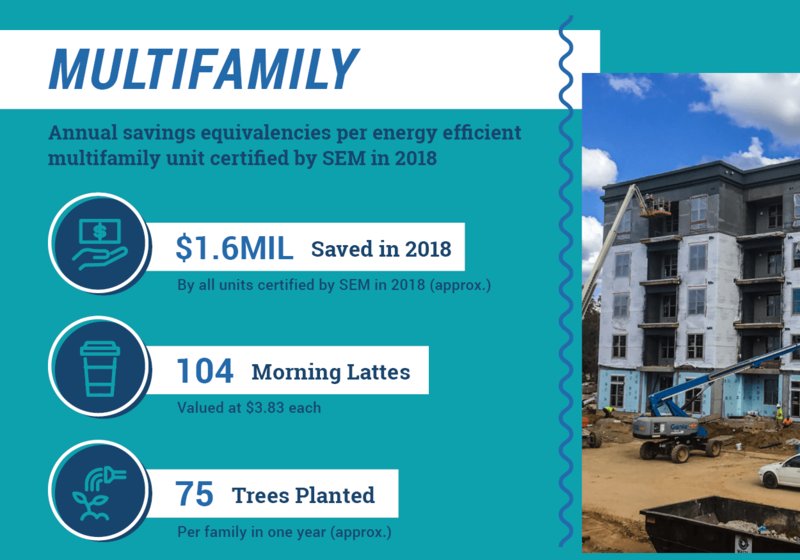 Last year we saw a big focus on building performance programs from multifamily projects looking to take advantage of additional funding by achieving green program certifications. This was accomplished with national programs like Fannie Mae and HUD MIP but also by taking advantage of local utility provider incentives like the HERO Code. By the end of 2018, we inspected over 8,000 units, certifying 62 projects, and impacting 6,833 families overall! The NGBS Green Partners of Excellence awards come out at the end of January and we hope to have more good news to share then! For 2019, we are looking forward to continuing to grow to add value to our clients by adding additional services around energy use and reporting, with hopes to impact 13,460 families! To see how our impact is growing, download our environmental impact report!